Works quickly on any green or dry forage without damaging it thanks to the perfect elasticity of the tines which adhere to any type of soil permitting an excellent cleaning during the raking and moving phases. 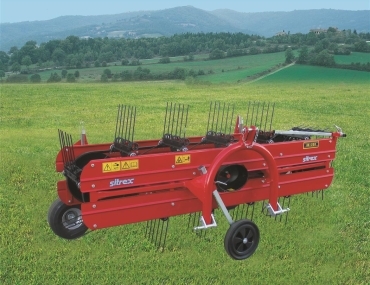 The windrow formed by the SITREX belt rake is never a long braid but rather a soft and light windrow. Exceptional performance in turning any kind of forage even at high forward speeds. All the ball bearings are watertight and require no lubrication. Working Width 190 cm / 75 in. Max Width 220 cm / 87 in. Length 125 cm / 50 in. Working Width 210 cm / 83 in. Max Width 240 cm / 95 in. Working Width 230 cm / 91 in. Max Width 260 cm / 103 in.